One day after a fire ripped through the celebrity laden enclave of Montecito, another blaze erupted in the Los Angeles area. Firefighters are currently working to save homes in the Sylmar neighborhood, at the southern edge of Angeles National Forest in the San Fernando Valley. 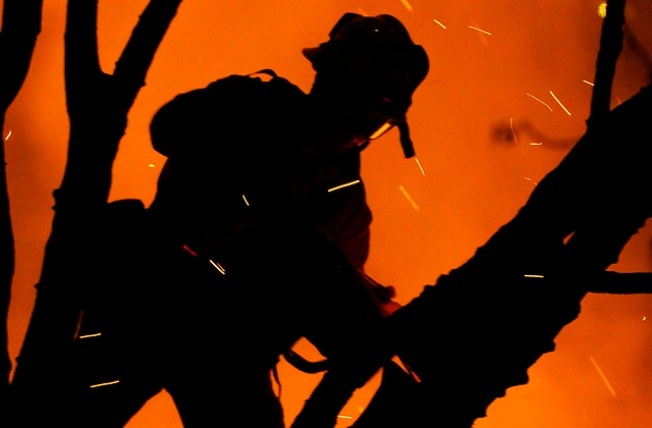 Melissa Kelley, a Los Angeles Fire Department spokeswoman, said the fast-moving fire had burned 100 acres after being reported around 10:30 p.m. Firefighters were holding their own Friday against the wildfire that destroyed more than 100 homes in a wealthy, celebrity-studded enclave, but another fire raging in Los Angeles had consumed five homes and was threatening dozens more. Much of the damage to homes and a small Christian college occurred Thursday night, but several more homes burned Friday in Montecito, a quaint and secluded area that has attracted celebrities such as Rob Lowe, Jeff Bridges, Michael Douglas and Oprah Winfrey. More than 1,000 firefighters worked to contain the 1,800-acre blaze ahead of winds that were expected to pick up by early Saturday morning. "It's not a time to relax," said Santa Barbara County Deputy Fire Chief Tom Franklin. "Everybody's got to be diligent through tonight. It's the last evening of these wind events." An acrid scent and thick shrouds of smoke lingered over Montecito on Friday night as firefighters walked the winding streets extinguishing hot spots. Utility workers were trying to cut off gas lines and restore power, while police set up roadblocks and patrolled the area looking for looters. Police said one person was caught Thursday but the patrols had discouraged other potential looters. At least 13 people were injured. A 98-year-old man with multiple medical problems died after being evacuated to a hotel, but it was unclear if his death was directly related to the blaze, Santa Barbara County Sheriff-Coroner Bill Brown said. Blistering winds gusting to 70 mph, dry brush and oil-rich eucalyptus trees helped turn an ordinary brush fire into an exploding inferno that quickly consumed rows of luxury homes and part of Westmont College, where students spent the night in a gymnasium shelter. At least part of actor Christopher Lloyd's property was damaged in the fire, the Los Angeles Times reported on its real estate blog. It said a Times reporter witnessed much of the "Back to the Future" actor's eight-acre grounds in ruins, and that he was filming on location in Vancouver but a caretaker had fled the property. Lloyd's agent had no comment Friday when contacted by The Associated Press, and messages left with his manager were not returned. Rob Lowe, the actor, said he fled with his children as fire engulfed the mountain and flames shot 200 feet in the air. The family stopped to check on neighbors and found them trapped behind their automatic car gate, which was stuck because the power was out. Lowe said he helped get the big gates open. "Embers were falling. Wind was 70 miles an hour, easily, and it was just like Armageddon," Lowe told KABC-TV. "You couldn't hear yourself think." Lowe said his house hadn't burned.